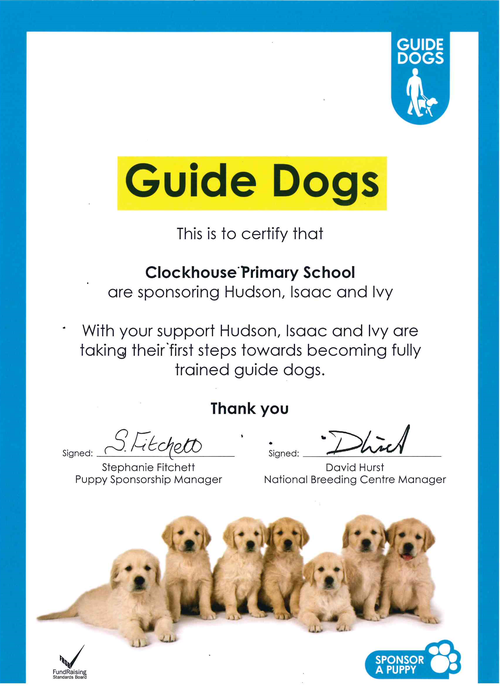 We regulalry receive 'pupdates' about the three puppies we are sponsoring with the Guide Dogs for the Blind. The three puppies, Hudson, Isaac and Ivy, have changed a lot since we first sponsored them as little puppies. HUDSON is living with a puppy walker in Bexhill-on-Sea. He has had trips in the car and on the bus to get used to being out and about. The one thing he doesn’t like is the sea! He has started to learn commands like ‘sit’ and ‘stay’. Over the summer he will be visiting busier places to get used to lots of people. ISSAC is settling in with his puppy walker in Rochford. He is a very quick learner and already knows commands like ‘wait’ and lie down’. He has two other dogs in the family to play with and learn from. He’s been on some trips to get used to buses, cars and people. In the summer he will be visiting the local park to play and learn more commands. IVY is having a lot of fun with her new family in Hertford. The two children in the family know the important job she will be doing as a guide dog. She is learning to be confident in different places and has travelled on the bus and train. She really enjoys people making a fuss of her and is learning commands like ‘sit’ and ‘wait’. We will hear more about the puppies’ progress in the Autumn term.